Boxing a tribute for a man who just completed a journey of 1000 films as a music composer in my usual limit of 1000 words is going to be tough. Even tougher is going to be the task of choosing from his expansive body of work for driving home a point. So it is with much trepidation, I sit to pen this tribute to the Maestro Ilayaraja, – as per me the best “all around” Indian composer of film music of our times on his 1000th film as a music director. The film Thaarai Thappattai (names of folk percussion instruments) and its maker Bala are indeed lucky to be a part of this milestone. 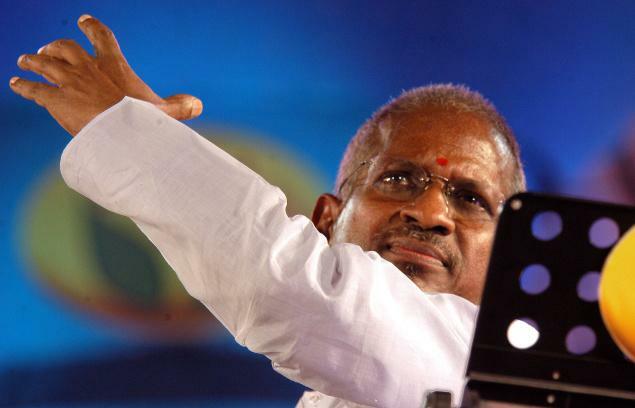 For those in their 40’s and 50’s and who grew up in the south of Vindhyas and Tamil Nadu in particular, Ilayaraja (Raja from now on) would have been a fellow traveller in life with his music. Tamil Film music has 2 eras – one before Raja and the other after. For the very discerning and ever critical ears in South India inspite of Raja making waves early, I would say he was on “probation” probably till his 100th film – Moodu Pani. That was a good 5 years since he made his debut in Annakili. Till then, there was a feeling that though he was good, he was repetitive and can’t see beyond Tharai Thappattai – folk style I mean. But ever since this landmark of 100 films I must say there was no looking back. And as we stepped into the 80’s Raja with his music was like “Narasimha Avatar” – Omnipresent. Thoonilum Irunthar, Thurumbilum Irunthar!!! Honest Disclosure. I am an unapologetic admirer of Raja’s work. A lot has been said and written about his modest upbringing, his travails as a struggler in Madras,..,… and how he became what he is today. So not going to dwell on those. This piece is entirely going to be on my connection with Raja and his work. For me the tipping point was Raja’s music in Bharathiraja’s Nizhalgal. In a middle class household with just a radio to define the entertainment quotient, my first brush with Raja was the Sunday afternoon programme in Trichy AIR called Neengal Kettavai where the top 10 songs of that time were played. I remember many weeks when the entire 10 songs were of Raja’s. Then gradually technology presented many options to be in touch with Raja. From his initial style of churning rustic tunes and melodies, gradually his repertoire extended to Western Classical melodies, tunes laced with Carnatic scales and other contemporary stuff. I started this intended hagiography like piece on Raja by saying that he is the best “All around” music composer of our times. His music was melodious at times, haunting at times, chirpy at times, romantic at times, melancholic at times. I am now at a loss of better adjectives. Enough to say that his music went beyond just great songs. Many aspects of his work prove this beyond doubt. In this song from the film Nayagan, the situation is of a duet between the hero and the heroine in happy times. Generally speaking any plain vanilla melodious tune would have done the job. But Raja comes with this peach of a melody – Nee Oru Kaadhal Sangeetham,..(listen here) which conveys the joyous mood between the lovers but with a subtle trepidation. The song moves you to no end and grows on you. Amazing stuff! Now look at the very many melodies he churned for plain vanilla duet situations which according to me are equally masterclass – Thendral vanthu ennai thodum,.. or for that matter Vaa Vaa Vaa Kanna Vaa for example. Like Raja’s knack of weaving the story line in the songs. In a sense using the songs to convey a sense of foreboding. If you listen to this song from Moondram Pirai – Kanne Kalaimane,…. A lullaby song which could have been just that. But Raja (combined with the words of another genius poet Kannadasan) weave a kind of pathos into the lullaby situation and prepare us for what would be coming. Like using a song as a theme in the Background score. Raja is a trail blazer in this. Another song is Poongaatru thirumbuma,… from Mudhal Mariyaadhai. As the film traverses from good times to sad times the mood of the theme song changes. Like being spot on in the choice of singers to suit a particular actor/character/mood. Though those days the choice was limited for singers unlike these days of “Super singers emerging from reality shows” – Raja was canny in his choice. So while he went mostly with SPB/Yesudas for Kamal, It was always SPB for Mohan. And as Rajinikanth transformed from being a villain to an anti – hero to a superstar – Raja also moved from Malaysia Vasudevan to SPB. And he sang himself for the rustic Ramarajan and the likes! When the mood is of sensuousness his call was to Janaki for the female voice. In Idhayathai thirudathey while most of the songs are sung by Chitra the one song (Om Namaha,…) which is a very romantic sensuous number he went with Janaki. By the way this song is another testimony to Point 1 as above. Like Raja being the best in business in India as far as Back ground score is concerned. Apart from his songs, his background score elevates the movie to a different level. I have seen this in many films. But the following examples sort of seal the point. Film is Maniratnam’s Thalapathy. Rajinikanth, Mammooty, Nagesh, Kitty and Arvind Swamy are engaged in a heated argument in Arvind Swamy’s office. Watch this clip. And watch how Raja’s BGM at the end of the scene lifts the drama element of the scene. Best part is for most part of the scene there is no BGM but the timely intervention is what makes it brilliant. This is just pure brilliance. In this very heart rending scene in Kamal’s Apoorva Sagotharargal – it is interesting to see how Raja value adds with his BGM. The Background score in Bhagyaraj’s film – Vidiyum Varai Kaathiru is a case in point where the BGM keeps you on the edge of the seat. Even in his latest outing Tharai Thappattai his BGM is haunting and at the same time outstanding. Watch this. Like without making it obvious, using classical ragas in many of his songs with small tinkering in the scale. Raga Amirthavarshini in Thoongatha Vizhigal rendu,..
Its only oflate that I began to realise that though Raja was been in the forefront of breaking the trend of Carnatic music based film songs till the 60’s, he actually tacitly adopted Carnatic ragas in his music without sounding so. Like his sense of Orchestration. Today composers just compose the tune and leave it to professional arrangers to do the orchestration part. I believe Raja is the only composer who does A to Z in his film as far as music is concerned. Right from the writing the tunes to choice of singers to orchestration to recording and the Background score. Though there are many songs which exemplify his orchestration sense this one song is enough to drive the point. Madai thiranthu thaavum nadi,.. – from Nizhalgal. For those who follow Tamil, it is easier to comprehend the situation and accordingly Raja’s response to that situation. The tune, the music arrangement all convey the gushing out of emotions of an aspiring musician. Simply fantastic. Beyond all this if I have to pick one song which brings out the all-around musical brilliance of Raja it will be the song – Raman Kathai Kelungal,… in Sippikkul Muthu. The song which begins in Reeti Gowla Raga is in katha kalatchebam or Harikatha format where the story of Sri Ram’s marriage with Sita is being enacted. The mix of genres from classical to folk interspersed with the story telling is simply superb. And look at the choice of instruments in the background from time to time. (Incidentally Kamal would use the similar technique in one of his later film – Anbe Sivam with another music composer – Vidyasagar to good effect in the song Naatukoru Seithi,.. which is in a street play setting. That many of Raja’s epic stuff had the actor/Writer/Director Kamal Haasan being a part of them is not a coincidence. It is very clear that Raja likes pushing the envelope and hence it is with ace film makers like Kamal, Maniratnam, Bharathiraja, Balu Mahendra, Balachandar, Bala,.. who didn’t draw the boundaries that Raja created some legendary stuff. I always believe that any creative output is always as good as the brief. So the role of these film makers in bringing out the best out of Raja cannot be undermined. At the same time even for all those run of the mill, pedestrian film makers he provided some evergreen music though they may not be of the legendary variety. Many times as I listen to the song/BGM and watch the movie I wonder with astonishment as to how Raja would have actually came up with that particular tune or the score. To be a fly on the wall of Raja’s recording studio is my dream. In second thoughts being spider on the wall is better (a fly makes a buzzing noise). To the original maestro of our times, Ilayaraja a 1000 cheers on this monumental achievement and a 1000 thanks for being the noisy fellow traveller in our lives!!! Kabali and the teaser da! Do check out my other blogs! https://anandkumarrs.wordpress.com : Politics, Media, Economy, India, Rants, Ramblings, Travel – basically all under the Sun! https://tambrahmism.wordpress.com : All around Tambrahm quirks. Satire. Fun.